Atmel公司的SMART SAM L21是基于32位ARM® Cortex®-M0+处理器的超低功耗MCU,最大工作频率48MHz(2.46CoreMark®/MHz),集成了高达256KB闪存和40KB SRAM,具有极专业的电源管理技术,高度可配置的外设如支持容性和接近式传感器的触摸控制器,非常适合用在可穿戴和物联网(IoT)市场.本文介绍了SAM L21主要特性,功能框图以及可穿戴演示板ATULPC-DEMO主要特性,框图和电路图. 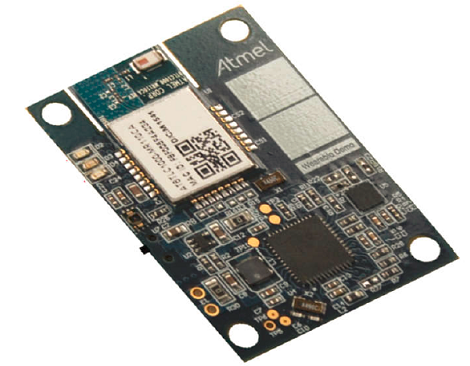 Atmel® | SMART SAM L21 is a series of Ultra low-power microcontrollers using the 32-bit ARM® Cortex®-M0+ processor, and ranging from 32- to 64-pins with up to 256KB Flash and 40KB of SRAM. The SAML21 devices operate at a maximum frequency of 48MHz and reach 2.46 CoreMark®/MHz. They aredesigned for simple and intuitive migration with identical peripheral modules, hex compatible code,identical linear address map and pin compatible migration paths between all devices in the productseries. 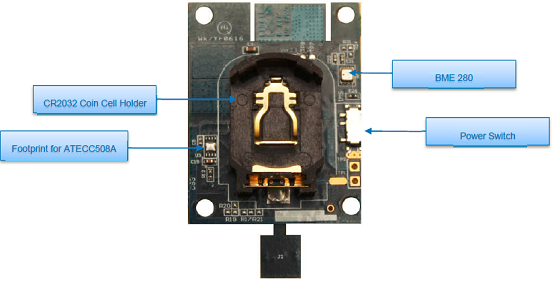 All devices include intelligent and flexible peripherals, Atmel Event System for inter-peripheral signaling, and support for capacitive touch button, slider and wheel user interfaces. 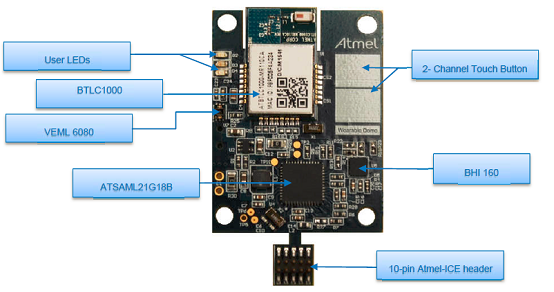 The Atmel SAM L21 devices provide the following features: In-system programmable Flash, 16-channeldirect memory access (DMA) controller, 12-channel Event System, programmable interrupt controller, upto 51 programmable I/O pins, 32-bit real-time clock and calendar, up to five 16-bit Timer/Counters (TC)and three Timer/Counters for Control (TCC) where each TC/TCC can be configured to perform frequencyand waveform generation, accurate program execution timing or input capture with time and frequency measurement of digital signals. The TCs can operate in 8- or 16-bit mode, selected TCs can be cascadedto form a 32-bit TC, and three timer/counters have extended functions optimized for motor, lighting andother control applications. Two TCC can operate in 24-bit mode, the third TCC can operate in 16-bitmode. The series provide one full-speed USB 2.0 embedded host and device interface; up to six SerialCommunication Modules(SERCOM) that each can be configured to act as an USART, UART, SPI, I2C upto 3.4MHz, SMBus, PMBus, and LIN slave; up to twenty channel 1MSPS 12-bit ADC with programmablegain and optional oversampling and decimation supporting up to 16-bit resolution, two 12-bit 1MSPSDACs, two analog comparators with window mode, three independent cascadable OPAMPs supportinginternal connection with others analog features, Peripheral Touch Controller supporting up to 192 buttons,sliders, wheels and proximity sensing; programmable Watchdog Timer, brown-out detector and power-on reset and two-pin Serial Wire Debug (SWD) program and debug interface. All devices have accurate and low-power external and internal oscillators. All oscillators can be used as asource for the system clock. Different clock domains can be independently configured to run at differentfrequencies, enabling power saving by running each peripheral at its optimal clock frequency, and thusmaintaining a high CPU frequency while reducing power consumption. The SAM L21 devices have four software-selectable sleep modes, idle, standby, backup and off. In idlemode the CPU is stopped while all other functions can be kept running. In standby all clocks andfunctions are stopped except those selected to continue running. In this mode all RAMs and logiccontents are retained. The device supports SleepWalking. 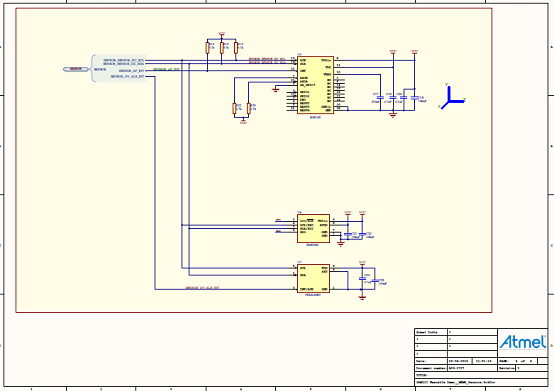 This feature allows the peripheral to wake uprom sleep based on predefined conditions, and thus allows some internal operation like DMA transferand/or the CPU to wake up only when needed, e.g. when a threshold is crossed or a result is ready. TheEvent System supports synchronous and asynchronous events, allowing peripherals to receive, react to and send events even in standby mode. The SAM L21 devices have two software-selectable performance levels (PL0 and PL2) allowing the userto scale the lowest core voltage level that will support the operating frequency. To further minimizeconsumption, specifically leakage dissipation, the SAM L21 devices utilizes power domain gatingtechnique with retention to turn off some logic area while keeping its logic state. This technique is fullyhandled by hardware. 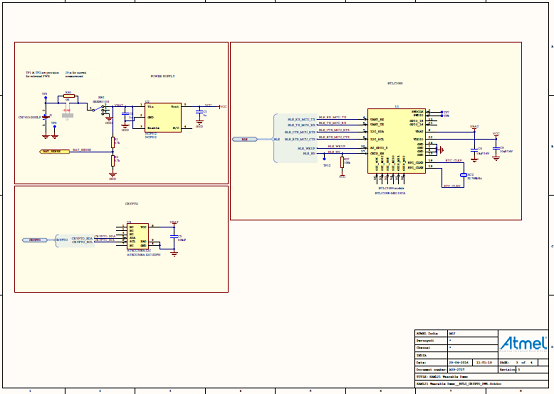 The Flash program memory can be reprogrammed in-system through the SWD interface. 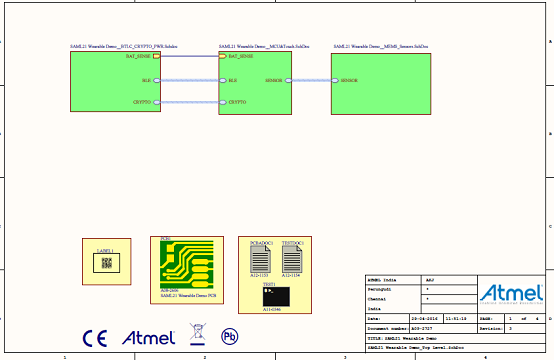 The sameinterface can be used for nonintrusive on-chip debugging of application code. A boot loader running in thedevice can use any communication interface to download and upgrade the application program in theFlash memory. 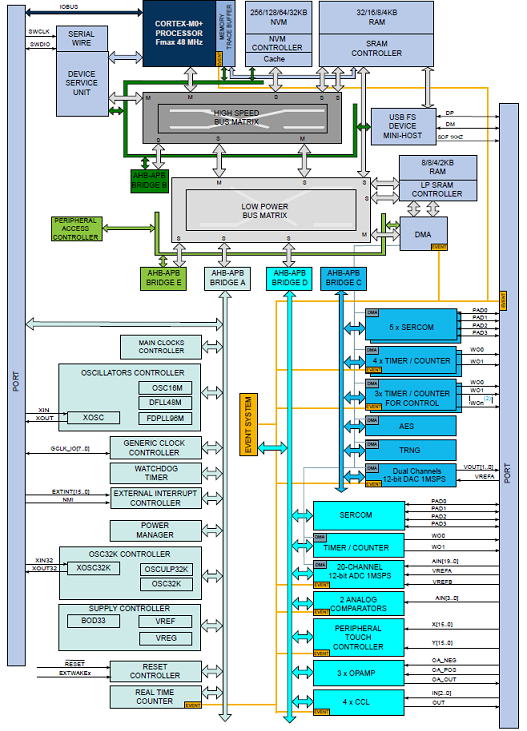 The Atmel SAM L21 devices are supported with a full suite of programs and system development tools,including C compilers, macro assemblers, program debugger/simulators, programmers and evaluationkits. 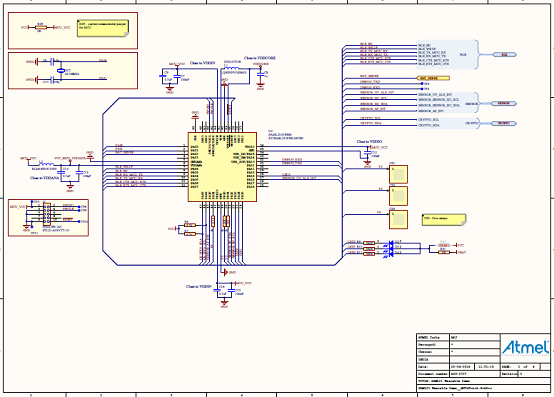 The Wearable Demo (Ordering code: ATULPC-DEMO) Reference Designevaluation kit is hardware platform to address the wearable and IOT markets.The Wearable Demo Reference Design incorporates Atmel® SAML21microcontroller and BTLC1000 module along with sensors to demonstrate acomplete solution needed for the IOT.Supported by the Atmel Studio integrated development platform, the kit provides easy access to the features that can be custom integrated in a design which will significantly reduce the Time-to-Market. The ATULPC-DEMO demo uses Atmel’s SAM L21 MCU, interfaced with BTLC1000 fully certified module and several sensors on a small form factor PCB (40mm X 30mm) operated on a coin cell battery. The environment sensor data (temperature, pressure, humidity, light), motion sensor data (3-axis acceleration, gyroscope) and sensor fusion data (3D plot, step count, free fall detection) are sent using BLE and displayed on an Android App. The HMI interface of the App is linked to a touch surface of the demo board, which is driven by the Peripheral Touch Controller integrated in the SAML21 MCU.